OncoFactory operates a unique technological platform exploiting an innovative patient-derived xenograft (PDX) animal model, the avian embryo. Miniature replicas of tumors from patient samples are created in a series of embryos in only a few days, for a large range of investigations. 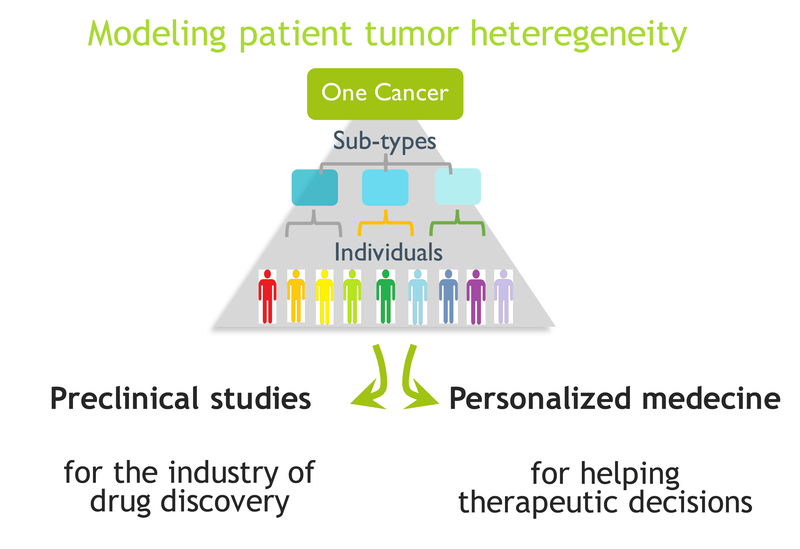 Our technology allows modeling the heterogeneity of patient tumors, statistical analysis of treatment efficacies, and a range of molecular analyses for biomarker and therapeutic target discovery. Oncofactory engineers the creation of miniaturized replicates of patient cancers in only a few days, using the avian embryo as a host. Our technology consists in micro-grafting patient samples in a way that enables the tumorigenesis in tissues which are homologous to those in which primary tumors emerge in the patient or in known sites of metastasis. 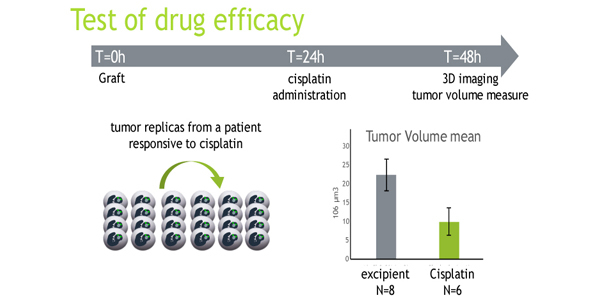 Therapeutic molecules can be delivered to the tumors. Tumor replicas are imaged in 3D in the entire organism by using high resolution confocal microscopy. A range of molecular analysis can also be conducted on tumor replicas, host tissues and fluids. What can we do with the Oncofactory technology? identify responsive patients and search for markers distinguishing them among the population of patients. What are the advantage of the Oncofactory PDX avian model? Efficient: Up to now, we faced no failure of tumor intake from patient samples, even for cancers for which no mouse model could be obtained, such as prostate PDX models. Fast: Patient tumoral cells survive, proliferate and cluster to form masses within 48 hours. We can monitor metastasis within the following days. Powerful: a patient tumor can be replicated in a high number of embryos, which allows testing many experimental conditions in parallel and conducting statistical analysis. Ethic: Our animal model strictly follows the ethical recommendations and benefits from highly simplified legal obligations. How and why does our model work? Classically, patient-derived xenografts are achieved under the skin of adult immune-deprived mice and often takes weeks and sometimes months to give rise to tumors. The dermis environment strongly differs from that of tissues in which tumors form in the patients and is poor in signals important for tumors to develop. In contrast, the embryonal tissues are rich in signals, different from one tissue to the other one, which ensure their building. The same signals will mediate tissue renewal at adulthood. Thus, tumoral cells can recognize these signals in the embryo and exploit them to proliferate and disseminate. By selecting the tissue in which tumors will form, we confront tumoral cells to an environment which evokes that of their site of origin in the patient. This makes it our model powerful to generate tumors in an optimal range of time.